2016 National Amateur Quail Championship, Dixie Plantation, Greenville, FL. 1955 National Amateur Quail Championship, Ardmore, OK. The National Amateur Quail Championship which had its inaugural running in 1918 in Thomasville, Georgia was the first of the current 16 prestigious AFTCA National Amateur Championships run in the United States and Canada. Half of those are still contested on wild birds. Second in seniority is the National Amateur Pheasant Championship which had it’s inaugural running in 1933 in Oneida, New York where it was contested for several years before moving to Ohio’s Killdeer Plains. Still in Ohio, the pheasant championship moved its home grounds to Dresden in 2010. One of the most prestigious contests on quail is the National Amateur Free-for-All Championship run since its inception in 1950 on the beautiful Sedgefields Plantation near Union Springs, Alabama. 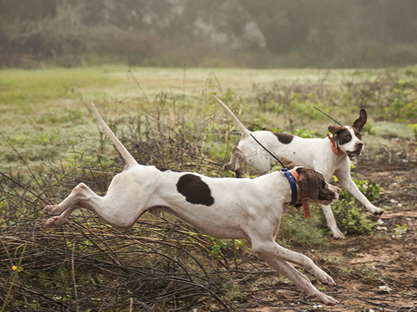 In 1952 the National Amateur (Quail) Shooting Dog Championship made its debut in Hernando, Mississippi. The 1950s, 60 and 70s introduced the National Amateur Pheasant Shooting Dog Championship, the National Amateur Chicken Championship, the International Amateur Woodcock Championship, instituted and held for all but one season in the woodcock-rich Maritime province of New Brunswick and the rotating National Amateur Grouse Championship. Amateur Championships were now contested on five species of upland game birds! The 1980s and 90s added contests on two additional bird species with the western National Amateur Chukar and Chukar Shooting Dog Championships and the National Amateur Prairie Chicken Shooting Dog Championship held on the Buena Vista grounds in Wisconsin Rapids, Wisconsin. 1982 also saw the inaugural running of the National Amateur Invitational Championship, followed ten years later by the National Amateur Shooting Dog Invitational Championship. The National Amateur Walking Shooting Dog Championship was added in 1988. The last two amateur championships to round out the current roster are the National Amateur Derby Championship in 1993 and the National Amateur Shooting Dog Derby Championship the following year. The AFTCA also sanctions Regional Amateur Championships, some also contested on wild birds, for all classes of pointing dogs.